What doth happened in thou’s parking lot? 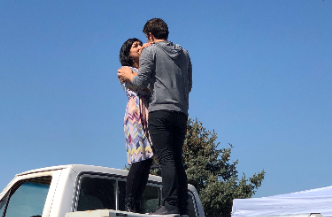 Denver Center for the Performing Arts actors embrace on top of a white pick up truck during their performance of Romeo and Juliet in Greeley West's parking lot on Wednesday. The Denver Center for the Performing Arts made the 60 mile trek to the Greeley West High School north parking lot to perform Romeo and Juliet to English throughout the day Wednesday. First, fifth, and seventh hour classes were treated to this year’s version by Shakespeare in the Parking Lot, a group of professional actors and actresses who hope to spread the arts to younger generations. The professional cast put a modern twist to the story by using an old pickup truck as the main prop and the actors were dressed in modern clothing. Multiple teachers pulled their classes out to come and support the arts. Senior Madison Aguilar, who attended the fifth period performance, appreciated the chance to see the theater come to life at West. “It was a great experience and the actors executed the play well with a modern plot to it,” Aguilar said. Drama and speech teacher Ms. Peggy Freemole, with assistance from principal Mr. Jeff Cranson made the performance possible. The DCPA’s goal is to show students real actors, real casts, and allow students who may never have been to the theater to experience some of its perks. Freemole’s goal in the end was to give students the opportunity to experience real acting. “As a theatre teacher, I understand all of the things one can learn from being involved in the arts. Some students might not get the opportunity to go down to Denver and see an actual performance,” Freemole said. The cast has been working on the Romeo and Juliet script for four years. They go on tour to help them improve every performance. In the last four years, the center had grown from six actors to eight actors, the extra two actors are floaters who are given the chance to learn the arts and get acting experience. The cast has very long days, eight to ten hours on most days they are performing. They perform up to four shows a day. After the English classes returned to their rooms, Freemole’s theater class was given the opportunity to interact with the actors in a question and answer period. Should seniors be able to rent out their own parking lot spaces? Yes - I want to show off my creativity and decorate it. Yes - I don't want sophomores parking in my spot. No - Parking lots should be first come, first served. I ride the bus, so it doesn't really matter.